The calligraphy world lost a most treasured colleague and friend on the cusp of this new millennium. On February 6th, 1914, Karl-Georg Hoefer began his comet-like ascendency through our calligraphic universe and on October 8th, 2000 passed through our world into the next. The analogy is fitting, I think, for this dynamo of letters, his passion for letterforms, his boundless energy and dynamic calligraphy. However, unlike a comet that has scorched its way across the sky and then is gone, Karlgeorg’s work and influence remain for us and future generations to enjoy and learn from. For those of us fortunate enough to have known him, Karlgeorg will live on in our memories and our hearts. My first exposure to Karlgeorg and his work was in a calligraphy class of Maury Neomy’s in the early sixties. Maury shared with us a series of monographs from the Klingspor Museum, one of which was on Karlgeorg and his calligraphy and type design. I was astounded by the almost Oriental quality of his calligraphy and surprised that a Western calligrapher could create such immediacy and expressiveness working with the Latin alphabet. From that point on I made a concerted effort to find out more about this man and finally, on a trip to Europe in 1976, my wife Marsha and I, with some friends, made a side trip to Offenbach am Main to meet Karlgeorg Hoefer and his wonderful wife and colleague, Maria. In 1981 I invited Karlgeorg to come and teach in the United States, his first trip to this country. Over the years our friendship grew as did Karlgeorg’s friendship with many others throughout the United States. 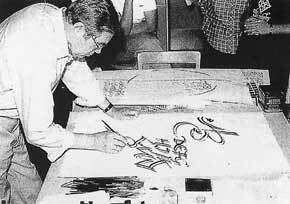 There are many of us who have cause for celebration, having had the opportunity to study with this master of the calligraphic art in numerous workshops throughout the country and to be exposed to the inexhaustable variety and beauty of his letterforms. Over the years, Karlgeorg relayed to us many pithy aphorisms regarding his philosophy about calligraphy. "Anfang und Augenblick", "Was neue ist?" and his unforgettable "never cease to begin and never begin to cease" expressed his belief that calligraphy had to be spontaneous and of the moment and always new. I can well imagine that at this moment Karlgeorg is yet again making new beginnings. Requiescant In Pace.